Yesterday we hung Maureen Wood’s quilts and boy do they look fabulous! 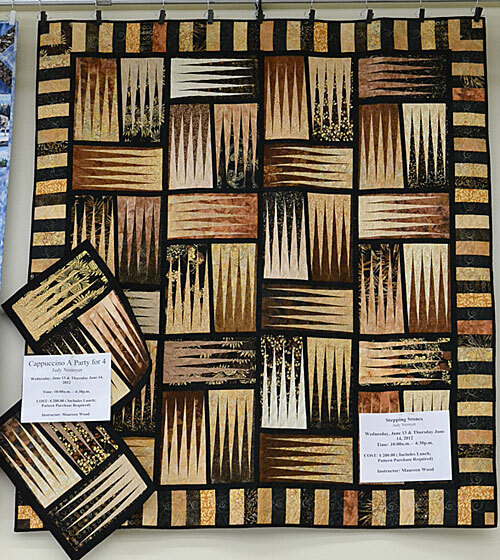 They are all Judy Niemeyer designs, and Maureen is a certified instructor coming to our store to teach this June. On June 13 & 14, she is teaching a choice of Stepping Stones, Waterfalls, or Cappuccino: A Party for Four (placemats). This is the perfect launching point for someone who has never done any kind of foundation paper piecing. 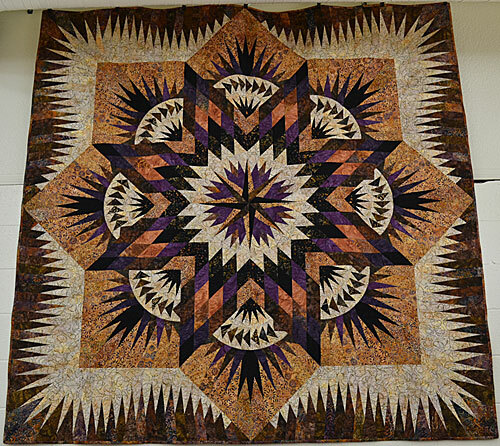 Then on June 15, 16, & 17 she is teaching from the Judy Niemeyer series of Lonestar quilts: Prairie Star, Dragon Star, Summer Solstice, Cattails in the Meadow, and Amazon Star. Pictured below is Maureen’s Prairie Star. Maureen’s classes are part of our Summer in the City series. Lunch is provided for all of these classes. Further details can be found in the class listings under the Events box on our homepage: http://www.alongcamequilting.com/ . Hope you can come by and see these up close and personal. 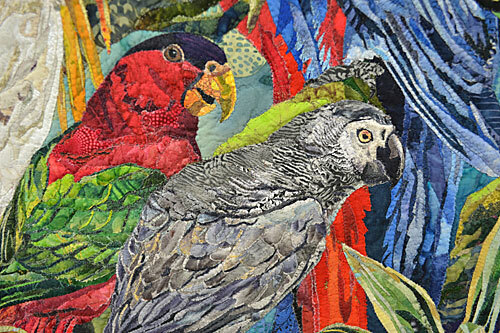 Perhaps you’ve seen this quilt on the cover of The Canadian Quilter or American Quilter magazines. 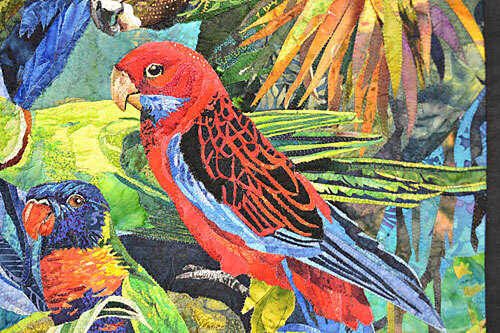 Or have you read an article in the International Festival Quilt Scene or Bird Talk? 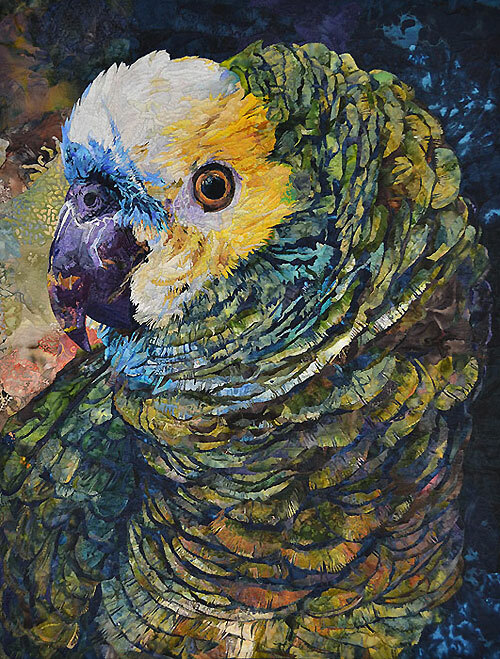 Maybe you even seen it live in the many quilt shows it has been entered and juried in. 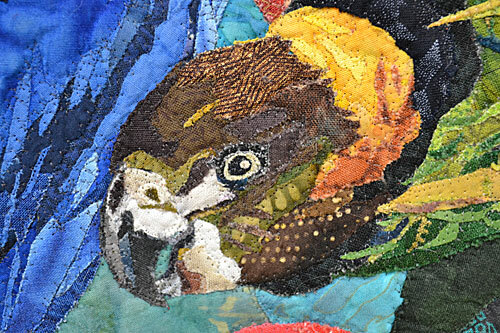 Close to home, you might have seen it at the 2010 Quilt Canada show where it won First place in Pictorial Quilts, as well as the Viewer’s Choice award. 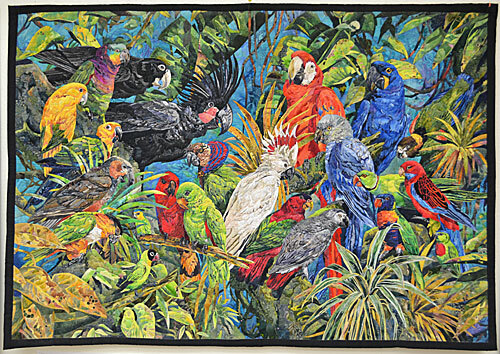 It is appropriately called Ruffled Feathers and was made by Roxanne Nelson. Kudos to Sheila Inose, who was the first out of the gate with the right answer, followed by Barb Birch, and Karen Macpherson. Liz, Jane must be snoozing. Marion, now that you’ve seen the whole piece, you might call Roxanne “Ms. Lova Parrot”. The write-up about her quilt listed her as being from Calgary. Yes, Calgary! I never heard of her or recognized her name as a customer, and I just find out about her in Houston! How could this be? We had lots of customers; I knew many quilters; but I didn’t know anything about her. It was a weird take on having to leave home in order to appreciate what it has. Another six years pass and I am at the 2010 Quilt Canada show held here in Calgary. Lo and behold, I turn the corner at the exhibit and there is Ruffled Feathers, made by this mysterious Roxanne Nelson. I ask around, yet she still remained elusive in the web of guilds and quilting contacts. Nineteen months pass, and last December the Sew Together guild that meets in our workroom had a speaker for their monthly meeting. It was all kept mum, as Corinne wanted this to be a real surprise – for everyone. 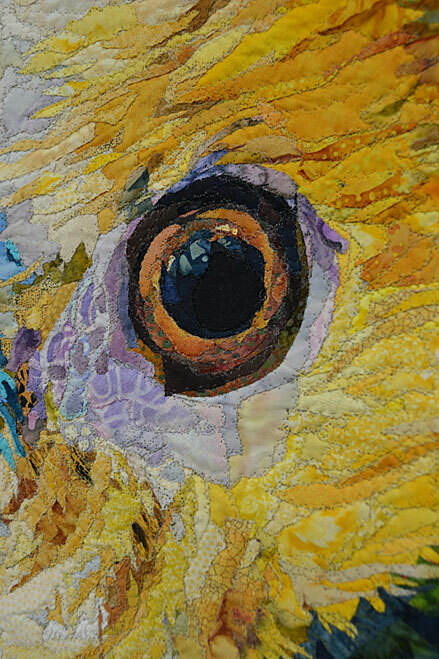 What a thrill is was to listen to Roxanne’s journey and process, and to view her quilts right up close and personal. At long last, the mysterious Roxanne was revealed! So opportunity struck and I grabbed it. 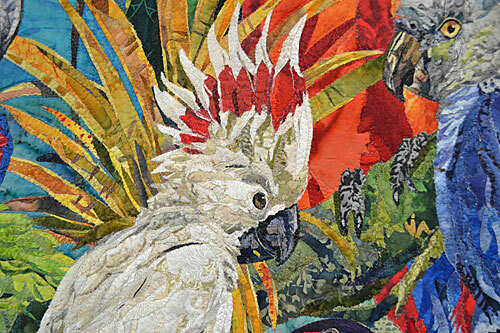 How happy I am to say that she is teaching Pictorial Quilting for us this summer at the store. If you would like to know the dates and price, please call us or check on our website under Events. I’ll finish off with a picture of Jewels of the Amazon. Have a great evening. 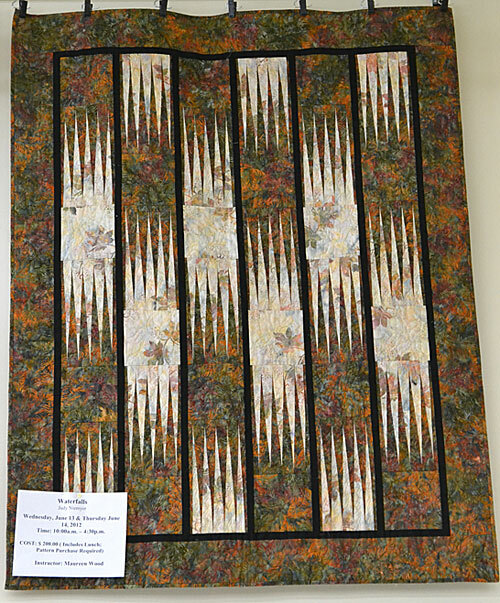 Do you recognize the quilt this is from? Or know who the quilter is?